Uvas Canyon County Park inspires hikers to pray for rain. Limitations: Dogs must be leashed. Camping: $10 per night, plus $6 reservation fee ($20, March through October). Call (408) 355-2201, or see www.gooutsideandplay.org to reserve a site. Driving directions: Take Highway 101 to Bailey Avenue exit, go west for 3.2 miles, turn left at McKean Road, go 2.4 miles, continue on Uvas Road for 3.7 miles, turn right at Croy Road, go 4.4 miles to the park (last mile passes through Sveadal resort – drive carefully, watch for kids). Mountain springs keep a trickle of water running down the park’s steep canyons most of the year, but the rainy season turns the park into a waterfall wonderland. Best time to go: a couple days after a major storm system soaks the South Bay for three or four days. 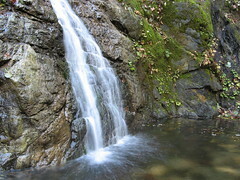 The park at the base of the Santa Cruz Mountains west of Morgan Hill has easy trails for waterfall watchers and challenging climbs up the sides of the canyon – almost all of it shaded by a dense tree canopy. Hardly anybody ventures off the main waterfall-viewing trails, which almost guarantees quiet forest solitude on the less-trodden paths. Standard precautions: Dress in layers. The canyon is cold, and it takes awhile to warm up. Paths near the creeks can be treacherous; a hiking staff or poles can come in very handy. Easy: The main Waterfall Loop, less than a mile, is the must-see walk. Highlights: Black Rock Falls, Upper Falls, Basin Falls. It’s not flat, and some areas are steep with tricky footing. Moderate: After you’ve seen the main falls, create a loop taking in the Contour Trail up the hillside for a mile and a half to Alec Canyon Trail; go east for a half-mile to the Triple Falls spur (Triple Falls can be gorgeous after a major deluge, but most of the time it’s dry). Return via Alec Canyon Trail for a nice four-miler. Hard: Uvas doesn’t have enough trails for an all-day outing, though Knibbs Knob and Knobcone Point promise steep climbs and worthy views of the distant Diablo Range.